The viola from the Stainer quartet was built in 1660. The length of the body is 40.35 cm. It has an original label with the inscription «Jacobus Stainer in Absam / propè Oenipontum 1660» [Jacobus Stainer in Absam near Oenipontum 1660]. All the parts of the viola are in very good condition and show little wear. It is the only instrument in the group that still has its original neck, although it has been lengthened at the foot, reworked and mounted in a modern fashion. The University of Hamburg also performed a dendrochronological examination of the viola’s belly. The wood could be attributed as from an Alpine region and its last annual ring is from the year 1648. The back is made from a single piece of wood, slightly variegated and sawed with a tangent cut. 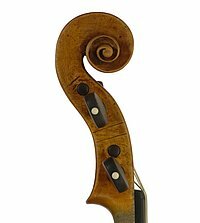 The scroll is made from a monochrome piece of maple and its form is reminiscent of a violin scroll with a lengthened pegbox. The appearance of the varnish is very similar to violin no. 2. The varnish is very thin and very slightly colored.